Motorola launched his latest budgeted smartphone with the name of Moto C in Indian market. The Moto C smartphone available in three different colors Fine Gold, Metallic Cherry and Starry Black which is priced at Rs. 5,999 only. This handset is also available at different retail stores in the Indian market. Last Month Motorola launched Moto C in the market which is available in two variants – 3G and 4G. Moto C 3G smartphone comes with 1GB RAM and 8GB ROM and priced at Rs 6,200. 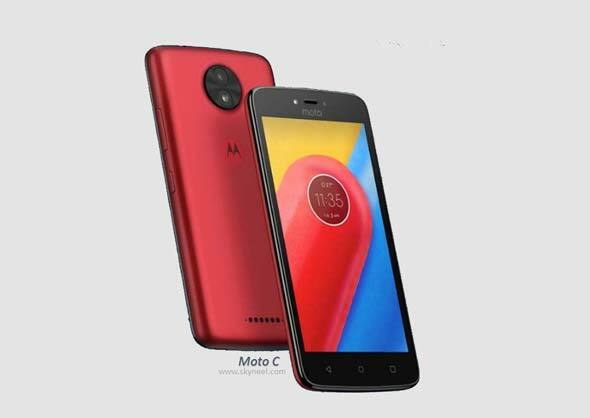 Moto C 4G variant comes with 1GB RAM with 16GB storage capacity which priced at Rs. 6,900. Now company launched his latest Moto C new variant which comes with dual SIM, 1GB RAM, 16GB storage with 4G VoLTE support. The Moto C 4G VoLTE support dual micro sim smartphone which is powered by 1.1GHz MediaTek MT6737M quad-core Cortex-A53 SoC. This Smartphone is priced at Rs. 5,999. This dual micro SIM smartphone comes with 4G VoLTE, GPS, Wi-Fi and Bluetooth v 4.2 support. Moto C dual micro SIM, 4G VoLTE support Smartphone comes with Removable Li-Po 2350 mAh battery in the Indian marked. Moto C smartphone running on the Android 7.0 (Nougat) operating system. This dual micro SIM smartphone comes with different connectivity feature 4G VoLTE, GPS, Wi-Fi 802.11 b/g/n, Hotspot, Bluetooth v 4.2, A2DP, LE, FM Radio with microUSB 2.0 support. This smartphone comes with Micro USB, 3.5 mm headset jack with company logo at the back panel of the phone body. This smartphone comes with 5 inch with FWVGA resolution (854 x 480 pixels resolution) with 4G support. The dimension of this smartphone measures 145.5 x 73.6 x 9 mm and 154 grams weighs. This smartphone is powered by 1.1GHz MediaTek MT6737M quad-core Cortex-A53 SoC with Mali-T720MP2 GPU. This Smartphone comes with 1GB RAM along with 16GB internal storage. You can be further expanded storage capacity up to 32GB via microSD card. The Moto C dual micro SIM, 4G VoLTE support smartphone is running at the Android 7.0 (Nougat) operating system. This Smartphone comes with 1GB RAM with 16GB internal storage capacity which is expandable up to 32GB with the help of microSD card. This Smartphone comes with 2350mAh removable battery which which comes with 5W charger. The Moto C smartphone comes with 5MP rear sensor camera with 1.4 micron pixels, 74 degree lens for view and 720p video recording, Fixed focus and LED flash feature. This smartphone also comes with 2MP front facing camera with fixed focus, LED flash, 1.0 microns, 63 degree lens for viewing feature. This smartphone comes with Burst mode, Panorama, HDR along with beautification feature. This smartphone comes with different connectivity features along with HDR, burst and beautification mode. It’s a good choice for all those user who want to 4G VoLTE support dual sim smartphone.